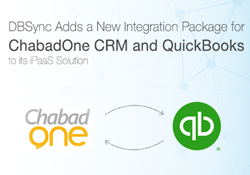 DBSync, an established iPaaS provider of solutions that easily integrate scattered data in a cost efficient and secure way, today announced it will provide an integration between ChabadOne CRM and accounting applications, like QuickBooks. With over 4 thousand Chabad centers around the globe, DBSync steps in a new niche and puts its top-notch integration technology to the service of the Chabad community. “Thanks to DBSync, our ChabadOne CRM and QuickBooks can send data back and forth unhindered, manual data entry becomes a thing of the past. That means the hours that the Chabad Emissary (shaliach) used to spend doing it are suddenly available for better things” - said Rabbi Kushi Schusterman, director at Harford Chabad. ChabadOne CRM offers a robust CRM solution that specializes uniquely for Chabad organizations. It has common CRM aspects, like contacts, financials, etc., but was designed specifically for the Chabad centers to help them foster better relationships with their constituents. It helps rabbis engage with their community members at the right time to keep them inspired to grow in their involvement as well as keep members posted about community programs, allow the centers to track donations and much more. “We’re thrilled to see more Chabad centers implementing integration between ChabadOne CRM and accounting applications. Today’s organizations need an easy-to-use, powerful solution to integrate members’ data across systems and be able to access it at any given time, becoming more agile and responsive to its members and changes in the community. And that’s exactly what our solutions deliver” - added Rajeev Gupta, CEO of DBSync. Streamline the processes and improve workflow to enable a non-profit organization to become more agile and responsive to its members and changes in the community. ChabadOne provides technology and communication-based solutions to Chabad Jewish Centers across the globe, including websites, email marketing and CRM solutions that all integrate. ChabadOne CRM is Salesforce-based application and is currently in use by Chabad organizations worldwide, enabling them to be more efficient and effective. Details information is available for users on the website. DBSync is a leading provider of data management, replication, and application integration for CRM (Salesforce, Microsoft Dynamics 365 and more), Accounting (QuickBooks Desktop and Online, Microsoft® Dynamics GP & NAV), Warehouse Management Systems such as SkuVault, popular databases (Oracle, Microsoft SQL Server, mySQL and more), and data integration markets. With easy to use pre-built maps and powerful Extract, Transform, and Load (ETL) capabilities, DBSync enables users to easily link information between leading Cloud and On-premise based CRM, hospital asset and case management, and accounting applications. Gartner, Inc., a leading IT research and advisory firm, has recognized DBSync in the Magic Quadrant 2016 and 2017 amongst global Integration Platform as a Service (iPaaS) solution providers. For more information on the platform and product features, please visit the website.